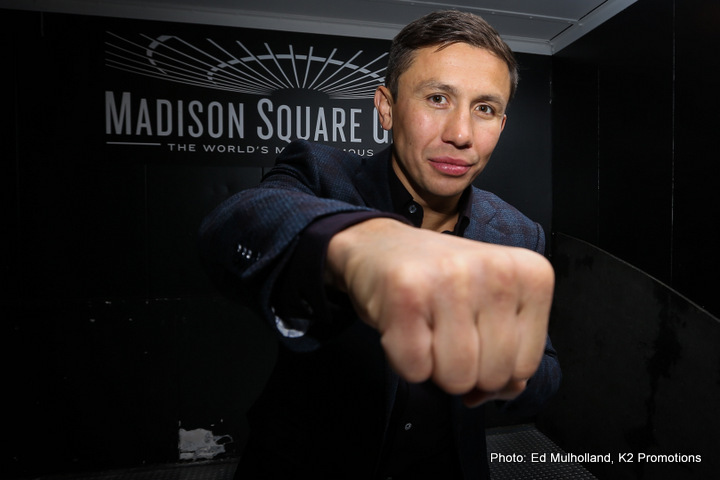 By Jeff Aranow: Demetrius Andrade says he heard middleweight champion Gennady Golovkin won’t fight a southpaw fighter on short notice for his May 5th fight date at the T-Mobile Arena in Las Vegas, Nevada. The southpaw Andrade (25-0, 16 KOs) says only fight Golovkin right-handed if he selects him to fight on that date. Golovkin is still scheduled to fight Saul Canelo Alvarez on May 5th on HBO PPV, but the Mexican fighter’s 2 positive tests for clenbuterol has the fight looking like it’s going to be soon cancelled. Canelo has a meeting with the Nevada State Athletic Commission in less than three weeks from now on April 18, and he could receive a suspension of up to 1 year. That would be the most severe. At the minimum, Canelo could be given a six-month suspension. “According to various media reports, GGG will not fight a southpaw on short notice,” Andrade said. ”Well, I did sign a contract with my right hand one time, so if it will help I am willing to fight Golovkin right-handed only. How about your Billy Joe Saunders,” Andrade. Andrade, 30, is starting to look a little bit desperate for the Golovkin fight, but it’s understandable though. Golovkin’s next fight on May 5th will be taking place on the Mexican holiday of Cinco de Mayo, and HBO will be televising it on PPV on their network. If the fight brings in a lot of buys, Andrade could walk away with a huge payday as the replacement opponent. Canelo will likely never fight Andrade. GGG is the only hope Andrade has for a big career payday, so he’s trying hard to get that fight. Andrade’s last fight was on HBO, but it’s unclear whether they’ve decided to keep televising his fights on their network. It was a boring one. Andrade hasn’t fought this year. His last fight was against Alantez Fox in October, and that’s Andrade’s only fight at 160. He’s a 2-time 154 lb. champion, but he never fought any of the talented fighters in the division. His best wins were against Willie Nelson, Vanes Martirosyan and Jack Culcay. Golovkin’s options for the May 5th fight are Jaime Munguia and Gary ‘Spike’ O’Sullivan. It’s believed that O’Sullivan will be the one that Golovkin faces, because he has an interesting style of fighting, and he’s not much of a threat to him. Golovkin won’t have to chase O’Sullivan around the ring for 12 rounds like he did against Canelo last September. That was a frustrating fight for a lot of boxing fans to watch, and the results afterwards were even less satisfying with the judges scoring it a 12 round draw. If Andrade doesn’t get the GGG fight, then he needs to get on his management’s case and push them to keep him busy and start matching him against good fighters. The major negative about Andrade’s career is he’s not been kept busy in the last 2 years. Since 2014, Andrade has had 5 fights in 4 years. Andrade should have had 12 fights in 4 years. His career would be a lot further along now.